As societal challenges involving sustainable development increase, the need to effectively integrate this inherently multidisciplinary topic into existing curricula becomes more pressing. Multidisciplinary, team-taught, project-based instruction has shown effectiveness in teaching teamwork, communication, and life-long learning skills, and appreciation for other disciplines. Unfortunately, this instruction mode has not been widely adopted, largely due to its resource-intensiveness. 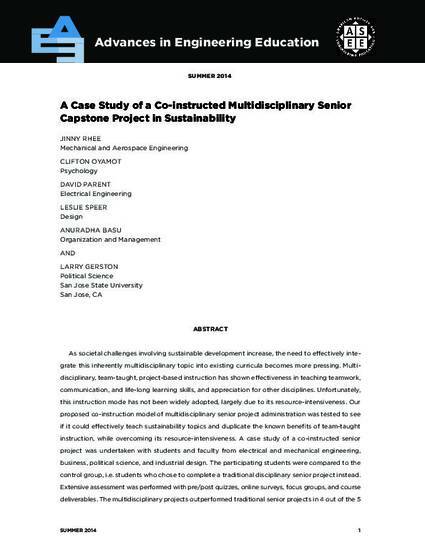 Our proposed co-instruction model of multidisciplinary senior project administration was tested to see if it could effectively teach sustainability topics and duplicate the known benefits of team-taught instruction, while overcoming its resource-intensiveness. A case study of a co-instructed senior project was undertaken with students and faculty from electrical and mechanical engineering, business, political science, and industrial design. The participating students were compared to the control group, i.e. students who chose to complete a traditional disciplinary senior project instead. Extensive assessment was performed with pre/post quizzes, online surveys, focus groups, and course deliverables. The multidisciplinary projects outperformed traditional senior projects in 4 out of the 5 participating courses. However, the students in the multidisciplinary project rated their satisfaction with the experience lower on average than the control group. A strong, positive correlation between students’ project satisfaction and rating of other instruction aspects (0.50 < r < 0.7, p < 0.01) was discovered, which has implications for all project-based instruction. Participating faculty generally found the process illuminating and engaged in scholarship and creative endeavors as a result. This article originally appeared in Advances in Engineering Education in Volume 4, Issue 2 and can be found online at this link.